On Friday, August 17th, at Kin Canada national convention in Sarnia, the Kin Club of Russell was recognized nationally as having the best service project of the year, “The Russell Township Sports Dome project”. They were also recognized with Cystic Fibrosis Canada’s Bill Skelly Award for its “Catch The Ace” project in which funds from this lottery were directed to cystic fibrosis research. Nationally, Kin Canada celebrated raising over $20,000,000 for its communities last year and as well having reached the $46 million dollar plateau of donations to Cystic Fibrosis Canada. Earlier in the day, the Kin Club of Russell was also recognized as having won the Outstanding Club Award, the Ken Pierce Membership Award (for growth), the Outstanding Boake Efficiency Award (for administration efficiency). Individual awards were also handed out to the Kin Club’s members; Maya Desrosiers won the Outstanding Maple Leaf Award and Doug Anthony won five (5) GEM Awards (awarded for sponsoring 3 new members in one-year period). 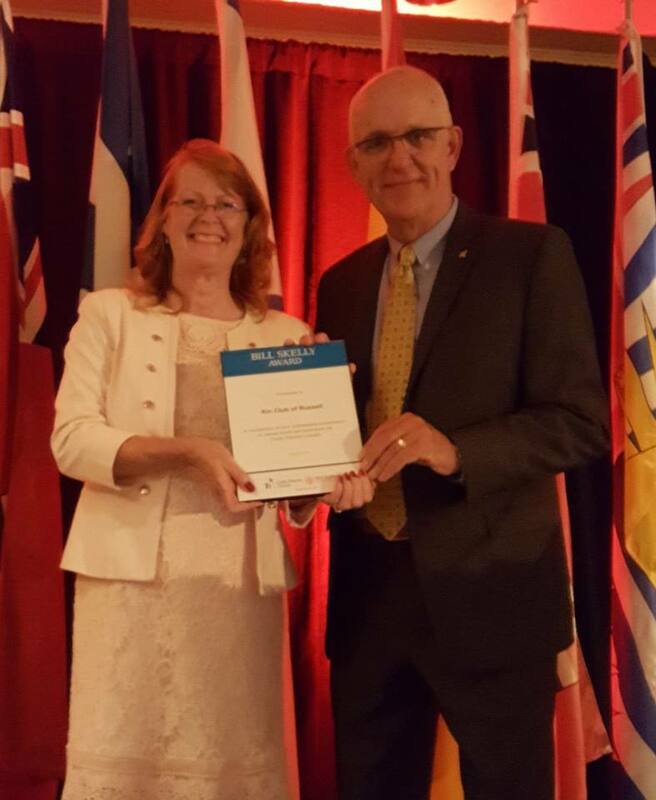 Kin Club of Russell president Cindy Anthony accepts the Bill Skelly award from Cystic Fibrosis Canada’s Board of Director’s Chair Mitch Lepage.